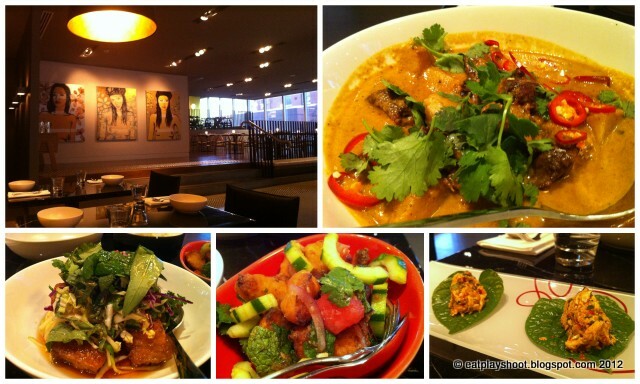 Red Spice Road (RSR) has recently opened up a sister branch in QV where the former Duck Duck Goose restaurant resided. Every time I venture into RSR, their famous carmelised pork belly dish is a must order. At first glance the recipe appears complex due to the combination of various flavours and textures. Hence I have not had the leap of faith to attempt it yet. I will post a copy of the recipe in another post. My dining partner and I went for an early dinner so the express banquet was offered ($25 per person). It comprised of an appetiser, 3 shared mains and steamed rice. One dessert offering was optional for an extra $5. My favourites were the pork belly and the pandan dessert. By comparison, I like the McKillop branch more. Pork belly came out warm and not hot thus the texture wasn't quite the same - I hate to think it was microwaved and understand the recipe takes a few hours to make. There's not much you can do with it once it finishes cooking. The service at QV was inattentive. Staff had to be waved at which happened on more than one occasion. The restaurant wasn't busy yet so either more staff was yet to clock on or they weren't assigned designated areas to look after. Hopefully it will pick up once they settle into routine. Three weeks has surpassed since. Will I return? Not in a hurry. I would rather walk over to the McKillop branch instead.